Full disclosure: This post contains references to products from Amazon.com and I may receive small compensation when you purchase product via included affiliate links. Make sure to read the new FAQ section! I’m still planning on adding more photographs, information, as well as an updated map. I will have it all done before the season starts. Included map is still valid though. If you have any questions that aren’t answered in this post, feel free to leave a comment (in the Comments section at the bottom of this page) or email me and I’ll do my best to provide you with the answer. First and foremost, please respect the birds! You are just a guest on their property! 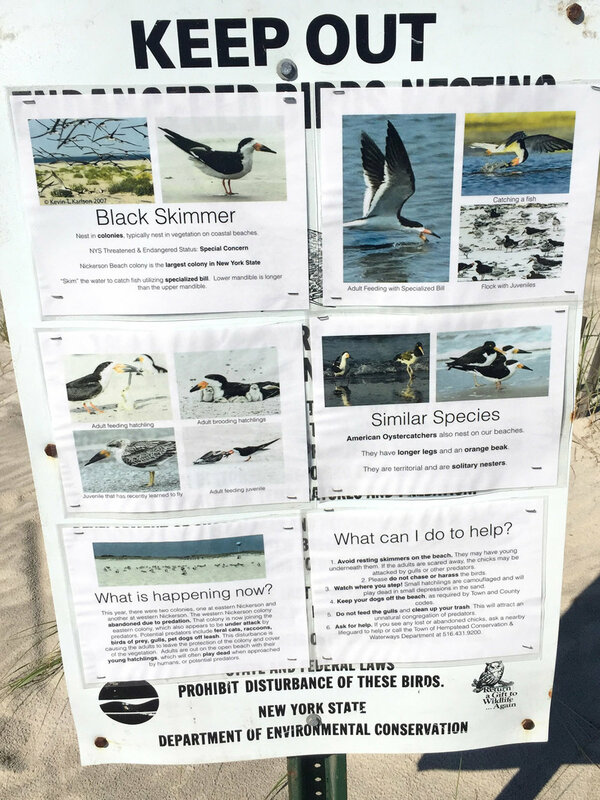 Do not cross protective boundaries surrounding the colonies and do not approach adults nor young birds at the close distance, especially when they are close to the waterline and/or walking with chicks along the beach. On hot, summer days, young birds can be very exhausted and any unnecessary disturbance can have fatal consequences. Do not “chase” the young if found outside the roped off area. Give them some space, and time, to return safely to the colony or their parents. When chicks are alone, outside the colony, they are an easy target for predating gulls. It happens much often that you think. Be respectful to other photographers that were on the beach before you! If you see someone lying on their stomach, close to the birds, most likely he/she spent some time and effort, to get to this position and to gain the trust of birds that they are photographing. Do not run/walk fast towards them nor stand behind them. This will most likely flush the birds they are photographing, ruining the opportunity for all. It can also cause unnecessary arguments. Try to make an eye contact with that person and approach when given the permission, by moving slowly and as low to the ground as possible. You will be rewarded with great opportunity of getting close to the birds, as well as making a new friend :) Most of the people that I've met there, are very helpful and are happy to share tips, only if you show them respect. Many of us have heard about some famous birding/photography location but never could make a trip there. Either we couldn’t find enough information about it or we couldn’t spend hundreds/thousands of dollars on a photography workshop that would guide us around. Often, these places are in a different state and many of us cannot afford to travel to unknown location just to "waste" valuable time, and money, on research of the location which often ends with coming back home with half descent photographs. One of these locations happens to be the Nickerson Beach, which is located 50 miles from where I live. I made it a summer tradition to visit it several times during the peak season and decided to finally share my thoughts and observations on this spectacular place and few tips on how to improve your photography there. Contrary to a common belief, it doesn’t take the most expensive camera gear to make great pictures. Following simple tips, that I'll share here, will take your photography to the next level. All photographs that you see here, were taken by following the same technique and required minimum post processing in Photoshop. For breeding colonies, you have excellent opportunity to photograph these birds engaging in a courtship, breeding, feeding young, flight etc. Green lines show the trails to the beach and the approximate location of the roped off area. - Area B (West Colony) here you will find lower number of tern and skimmer families but birds may be a little bit closer. On my very first visit to the Nickerson Beach this is where most of the birds were. In the last couple of years, occupy the Area A. - In June, between the Area A and Area B, often you will find at least one American Oystercatcher nest. Right on the center of the beach :) Nest of course is roped off for a protection but easy to spot. - Walking along the shore from Area A to Area B and further, you will find American Oystercatchers, Piping Plovers and other shorebirds feeding. Also, there will be skimmers and terns diving for fish. If the foot traffic is low, some of the older chicks will also come to the water's edge. Especially on the hot days. Young birds often leave the roped off areas to cool off in the wet sand. - Also, if you are there on the day of or after heavy rain, look for puddles on the beach or parking lot. Birds love to bathe in them! American Oystercatchers - mate in mid April throughout May. Chicks start to hatch in mid June and turn to juvenile plumage by late July. Leave the beach by mid September. Common Terns - mate in mid May. First chicks start to hatch in late June. By mid July most of the colonies have chicks. Leave the beach by September. Black Skimmers - mate in mid June. First chicks hatch in mid July. By early August most of the colonies have chicks. Leave the beach by mid/late September. Starting mid March, first arrive to are American Oystercatchers and Piping Plovers. In late April/early May, you can find most of them mating and establishing territory. In early June, chicks of these birds are starting to hatch and young birds are exploring the beach. This is the best time to find adult birds feeding their chicks. Mid May is the time when the biggest colony on the beach, Common Terns, start their courtship. Most of the young terns start to hatch in early July. Late June to an early July is the time when Black Skimmers are mating with the majority of their chicks starting to show up in an early August. Keep in mind that these times are for the majority of the species population, meaning, some birds of the same species will have young before or after the majority of the colony. For example, in mid June you would expect to find 3 weeks old oystercatcher chicks, but there is a possibility of finding an oystercatcher nest still with eggs. In mid July of 2016, I was surprised to find 3 families of Black Skimmers already with chicks! Definitely the earliest hatching of skimmers for me there. But majority of Black Skimmers were still being seen mating... Summer 2018 was most likely the oddest and the longest season for me. The last Oystercatchers hatched in late July! The last Black Skimmer chicks hatched in the first week of September! Those that subscribed to my Location Updates, had a great opportunity to follow the Black Skimmer hatching from the very first nest to almost the last one. Nesting and hatching dates vary from year to year. The most predictable are Common Terns, as they are the largest colony on the beach. It is safe to bet, that you will see tern chicks in early July. When it comes to American Oystercatchers, some years most of the families have chick at the same time, in mid June-early July. In some years, there are chicks hatching as late as mid August, as it happened in 2018. The hardest to predict are Black Skimmers. Some years, chciks were hatching as early as mid July and as late as mid August. Some years, as the Summer 2018, there were chicks hatching as late as mid September! The best is to follow my Location Updates that you can find here: https://www.greggard.com/location-updates/nickerson-beach-ny-2019 - I used to provide these updates for free but this caused a lot of negative feedback from local photographers. Update from 6/2/2018 (down below) explains it more. Saving your money on tolls and fees? Arriving for the best possible light for photography, before sunrise and sunset, you don’t have to pay an entrance fee. As of the season 2018, $35 admission fee to the beach, is collected between 9AM and 4PM. (In the previous years, toll booths were open as early as 8AM until 6PM.) I will update the hours if anything changes. The "secret" on getting the most pleasing photographs of birds on the beach, is to photograph them at their eye level (more on this technique coming soon), with the sun still low on the sky and behind you. To achieve this, it is best to arrive early or stay until sunset. If you are coming for a sunrise shoot, make a plan to be on the parking lot 20 minutes before the actual sunrise. This will give you enough time to use a restroom, prepare your gear and head towards the beach. The path to the biggest colony (Area A on the map aka East Colony) is located right next to the Women’s restroom. The walk from the parking lot shouldn’t take you more than 15 minutes to get to the area where the birds are. First ~100 feet is on the temporary “blue matting” but the rest of the walk is on the sand. It may be strenuous for some, so please plan accordingly. Arriving early to the colonies will allow you to get familiar with the place and to find the best spot along the roped off area. Nesting areas are roped off to protect the birds. Please be sure to respect these boundaries and do not go beyond these demarcations. This is a very special place that we are privileged to be able to visit and photograph, and some of these birds are threatened/endangered. If authorities see disturbance at the nest sites, they move the ropes further away from the birds. If you stay low to the ground, and be quiet, most likely birds will get accustomed to you quickly and will get closer. This is the key to get that perfect photograph! Let the bird to know that you are no harm and it will get comfortable with your presence. How comfortable? On many occasions, I had a few days old Common Tern chicks walking up to me and resting next to me, taking advantage of the shade created by my body :) It is also possible that you will find some birds outside of the ropes. Please give them space. Do not approach to close and do not run in their direction! As with any wildlife, it is always best to approach these birds slowly, very low to the ground. If you see any photographers already laying down and photographing birds, please do not walk up to them. Approach slowly, make an eye contact and wait for their permission to approach. You never know how much time they spent to get to this position and you can ruin their efforts in a matter of seconds. Please refrain from loud talking. Birds seem to be aggressive and constantly fly over you? If this is your first time on the beach, where terns and skimmers nest, do not be surprised if birds start flying over you. This means that you are to close for their comfort. Common Terns are usually the most aggressive birds on this beach. The moment the first chicks hatch in the colony, terns get very protective. Terns won’t get stressed if you lower yourself and approach them very slowly. More on that, in the FAQ section below. Even though any lens above 300mm (on the crop camera body) is good at this location, as with most wildlife, the best is to keep the distance from it. Therefore, lens longer than 500mm will keep birds more comfortable with your presence. Bring teleconverters too! In some situations, “wider” lens is also suitable for flight shots and landscapes, especially during sunrises/sunsets. I mostly shoot at 840mm (600mm + 1.4x extender) and 1200mm (600mm + 2x extender) on a full frame camera. You should wear shoes and clothes suitable for walking on sand. Don't forget that the most intimate photographs are taken at the bird’s eye level. This means that you will be spending most of the time on your knees and even you stomach. Convertible pants and long sleeve shirts work best. Breathable clothes with UPF 50+ rating are highly recommended: http://amzn.to/2sKz8Gu - I wear over the ankle hiking boots, long pants and long sleeved shirt. Long pants and long sleeve shirt protect my knees and elbows when crawling on the sand to get the best angle. Depending on your comfort level, photographing near water may require a waterproof layer of clothing - rain pants/jacket or even waders. Unfortunately, I do not have any personal experiences and I don't have any recommendations for hotel stays in the area. I'm hoping to get this info up here soon though. At the moment, I would advise to use your favorite hotel chains or/and use the Trip Advisor or Yelp for hotel reviews. Or if you prefer, Airbnb. Also don't forget to use Yelp for food recommendations in the area ;) There are some great seafood restaurants nearby with two at the Point Lookout, NY (just 10 minute drive from the beach). Have any tips on good hotels in the area? Please leave a comment or email me. The best way to time your next visit is to follow my Location Updates, where I share the latest happenings at the beach, where to find birds that are best for photography etc. You can find these updates, here: https://www.greggard.com/location-updates/nickerson-beach-ny-2019 - sample of the information given can be found at the bottom of this page. Looking for other birds to photograph? Due to time constrains and unpredictable schedule, I currently do not offer workshops. I strongly believe that with information provided in this guide, and my Location Updates, you will be able to get the most out of your visit to the Nickerson Beach without any help. Nevertheless, if you would like to have more guidance with your visit to the Nickerson Beach, and more help with your photography, I know couple of photographers that would gladly provide/conduct a workshop for you. Just keep in mind that the average rate is +$300 for half a day or +$80 per hour (3 hours minimum). Some photographers offer multiday workshops but these start at +$1000. If you are interested in any workshops, let me know via email (info at greggard.com). By not buying this guide (~$50), by not paying admission fee ($35), by avoiding tolls (at least $8.50 one way) I saved you at least $93. If you visit the beach more than once, you will save a lot on just not paying admission fee. I hope you will appreciate these savings :) In return, I would appreciate if you could share the links to this post with everyone that might be interested in photographing or watching these nesting shorebirds. Share the link to this page on any social media outlet you use: Facebook, Twitter, Instagram, Pinterest, anywhere you like. Just save it in your bookmarks/favorites and shop away :) Remember, that the cost for you stays the same. I will simply receive a small percentage of the amount you pay. No personal data is shared with me either. Not only you will help me to update this post more often, to create more helpful content but also you will help me to make a bigger donation to The Raptor Trust at the end of the year! If you are not an Amazon Prime member yet, I would strongly recommend trying it out! With Prime membership you are getting not only free 2-day shipping but also free video and music streaming, free electronic versions of many books and magazines, as well as a very important feature for photographers: free unlimited photo storage. Some of you, not using Amazon, expressed an interest of simply making a donation. Simply click on the Donate button and follow the instructions. You don't need a PayPal account to donate and you can use any credit card: Visa, MasterCard, AmEx etc. All transactions are handled by Paypal and no personal information is shared with me. Anything helps. Have more time and want to discover new birding spots in New York City and on Long Island? Check out this book "Birdwatching in New York City and on Long Island" - http://amzn.to/2f9mEHt It covers the latest information on many birdwatching locations in the area: Manhattan, Brooklyn, Queens, Bronx, Staten Island, Nassau County and Suffolk County. Birds are too aggressive and are attacking me! What to do? You are too close! Go back! Birds are simply trying to protect their nests. Each bird has its own permitter of comfort. Some won’t be alarmed until you are 20-30 feet away, some will be alert and aggressive even if you are just walking by at 100 feet from their nests. First of all, make sure to wear a hat. Not only to keep you from the sun exposure but also from bird droppings and possible nick/cut on the head from low flying birds. Secondly, the best way to approach birds, so they are not alarmed with your presence, is to lower yourself. This means that you need to be either on your knees or even crawl on your stomach. Sorry to say, but it is not about your comfort at this point. It is all about to keep birds calm. Once you are low, start slowly approaching birds. Do not talk. Move 5 feet forward and stop for a minute or two. If bird didn’t react to your movement, move another 5 feet and wait. Repeat it until you get to the desired position. Is it crowded/worth coming during 4th of July weekend? Simply put, I don’t see any difference in amount of photographers when comparing 4th of July weekend and a normal weekend before or after. Unless there are multiple workshops organized at the same time. No matter what, you will see the most amount of photographers between mid June, throughout July until mid August. This is the time when most of the chicks hatch. July seems to be the most active month for both, birds and photographers. Is it better to come during the week or on the weekend? No doubt, weekends bring the most amount of photographers. Knowing this, many photography workshops are conducted during the week. Therefore, do not expect having beach to yourself, no matter if it is a weekend or regular week day. Nickerson Beach has been popular since 2000’s and on average, there are 10-15 photographers on the beach every morning. At the peak of the nesting season amount of photographers can reach 20-30, depending if there are any camera clubs/workshops visiting as well. But this shouldn’t discourage you. If you are coming for the first time, this will help you to find birds quicker :) If you don’t like photographing in the group, you can simply walk a little further and find another scene to photograph. There is too many birds to photograph anyways. There is always something worth of photographing along the beach. Just keep exploring :) If you cannot find any nests near the ropes, start photographing birds in-flight or fishing at the water line. There is a lot of opportunities! When is the best time to visit Nickerson Beach? Common Tern chicks? - then 2 first weeks of July should be best. Black Skimmer chicks? - then end of July and early August should be best. American Oystercatcher chicks? - First chicks start to hatch mid June. Depending on the year, other pairs will either have chicks at the same time or weeks later. What part of the day is best? In my opinion, the best time for photography on the beach, (any public beach), is the sunrise. As there is not to many beachgoers at the beach yet, and birds can be found closer to the ropes and at the waterline. Also, there are better chances to photograph chicks being fed as they weren’t eating as frequently at night. Sunsets are good for flight photography at the West Side of the Area A when birds are returning to the colony. Tall grass covering the colony, gives nice, green background. How long is the walk to the colony? The biggest colony, Area A, is located about 10 minutes walk from the parking lot. First 100 feet is through the dunes, on a “blue” mat. After that, it is just sand. Keep in mind that the sand at the NB is very fine, your feet will sink more in, slowing you down. If you have any kind of injury, or health conditions, please plan accordingly and give yourself more time. The return walk will hit you the most, as you will be walking in a stronger sunlight. Bring enough water so it lasts until your return. Can I bring a cart to the beach to help carrying my gear? I never inquired about this at the office, and didn’t see any signs with information, but over the years I’ve seen many photographers, and beachgoers, bringing carts and never getting into trouble. Any other type of wheel will sink right in and you will spend much more energy dragging it behind you than carrying a backpack. Not worth the hassle in my opinion. This particular cart seems to be most popular with photographers: https://amzn.to/2EOAFU8 that strap the milk crate at the base that holds the backpack and tripod. Once again, it depends what is your goal for the day and what gear you are shooting with. Should I wear kneepads / elbow pads? It depends on your personal comfort level. I personally feel comfortable with simply lying down on the sand without any pads or mat. Sand at the Nickerson Beach is very fine, and there is not much shells/rocks that would cause any discomfort. Sand is usually warm enough to sit for prolonged time (unless it was raining the night before). Wearing long pants and long sleeve shirt protects skin on my knees/elbows while crawling. If you are planning on shooting near water, keep in mind that sand is wet there. Therefore, bringing waterproof layer is a good idea. I’ve seen others simply lying in the water for hours. It all depends on your comfort level. To my surprise, there is a "new", temporary, colony of Black Skimmers. It is located between Area A and Area B. Closer to East side of Area A. This colony, of about 50 adults, has chicks ranging from a 1 week to 3 weeks old. It is possible that these birds just happened to spend only a night there but it was cool see them up close. This is why it is important to get there first thing in the morning. Birds are outside the roped off area. I spent more time at the tide pools, South side of Area B. This week's new arrivals are at least 8 Ruddy Turnstones and large group of Semipalmated Plovers. I was able to find some juveniles Piping Plovers mixed in as well. Shorebirds are migrating! This season is a little bit different than my last 4 seasons there. Black Skimmer colony ventures outside of the grassy, roped off area and spends most of the time about 20 feet behind life guard stands. To my understanding, it is caused by an increased predation in the grass area, mainly raccoons. Black Skimmers venture out into the open space to easily spot an approaching raccoon. You may see a temporary "fencing/rope" set up to protect this colony. This is notset up to keep photographers away! It is set up to protect chicks when adults fly away and beach goers could accidentally walk over them. Also, in the mornings, there are vehicles driving along the beach. Forecast called for a cloudy morning but it ended up to be sunny! Hot and humid morning at the Nickerson, perfect for shooting birds against/straight to the sun aka silhouettes. All that haze in the air created beautiful yellow/orange background. Another hot morning at the Nickerson. Luckily there was a steady breeze coming from the ocean. Once again we saw raccoon tracks on the sand but not as many as yesterday. Poor Black Skimmers :( My goal for today was to find yesterday's Red Knots so I went straight to Lido Beach, West of Area B. REKN's showed up late, around 7:30AM. I assume that they rest somewhere further away but come to Lido Beach when scared by first people coming to the beach. Overall good day today. New arrivals were hundreds of Semipalmated Plovers. First, I saw a group of them resting in the Area B and then most of them either were feeding along the shore or roosting on the beach. Lots of Semipalmated Sandpipers and Sanderlings as well. I believe that number of Ruddy Turnstones was also larger, compared to yesterday. I saw at least 30. Not to many photographers again. Either, they gave up because there are no more chicks to photograph or just simply it was to hot. More photographers came to the beach this morning. Unfortunately season is at its end. Most of the Common Tern and Black Skimmer juveniles are spread out and more time is required to find them. The best are early mornings, right at the ocean's edge. As for migrating shorebirds, it looks like there were more departures than arrivals. Same variety as previous week but with much lower numbers of each species. There were large flocks of birds resting on the sand rather than feeding at the shore. Several American Oystercatchers arrived late March, and as of today, April 15th, they started to set up territories and are displaying mating rituals. If you are interested in photographing their courtship, next couple of weeks should be the best time to get there. I had plans to visit the beach today but heavy traffic stopped me from venturing in that direction. I've heard from two sources though that American Oystercatchers and Piping Plover are incubating their eggs, with oystercatcher chicks being expected any day now! Pretty cool! I wouldn't be surprised if Piping Plover eggs hatching as well... I will keep you posted. Thank you all for using my Amazon's affiliate link! - http://amzn.to/2alLCx2 - You helped me raise over $130 in 2016 that went to Conserve Wildlife Foundation of NJ! My latest video: http://www.greggard.com/blog/2017/6/american-oystercatcher-chick-ny was well received and generated great feedback and a lot of views on social media. Thank you all that liked, commented and shared this video! Just got an email from a friend informing me that there are still 2 American Oystercatcher nests with eggs in the Area A. That means that you still have a chance to photograph young oystercatchers :) Have fun! And please send me any update either via email or simply by posting a comment down below. Thank you all sending me updates thus far! I really appreciate it and I'm happy to see that this guide is helpful to all of you! I'm glad to see more people using my link for their regular shopping at Amazon :) Thank you! I'm also very grateful for more people contacting me with the latest sightings. You are all helping each other! As of today, there are more and more Common Tern chicks "popping out" in the Area A. Additionally, at the same colony, there is a family of oystercatchers with just hatched chicks and one nest still with eggs! Pretty cool! Thank you all for the reports! Keep them coming! Also, please share this blog post with your friends. Remainders of the tropical storm Cindy brought in a lot of rain and high waves to the Nickerson Beach last Friday. Today was the first time that I saw at over 20 surfers at their favorite spot taking the advantage of the higher surf. High waves combined with the high tide brought in water close to the nesting birds as well. At some spots, water got well behind the fenced off area. But birds seem to be doing fine. I found 3 oystercatcher nest still with eggs! and very close to the "string" in the Area A. Lots of Common Tern chicks around as well. While walking between Area A and B I found 2 juvenile and 5 adult Piping Plovers. There must be more of young plovers around but I didn't spend much time to look for them as I had to go back home. At the same area but closer to the water, I found also family go oystercatcher with 2 very young chicks :) Always fun to see those for sure. Send me an email or message on Instagram, if you want to know the exact position where I found these birds. Another great morning at the beach! I would strongly recommend to photograph birds at the Rain Pool in the next couple of days. Remember light is best there in the morning. I paid a quick visit to NB this morning. Water level at the Rain Pool is half of what I saw just 3 days ago but it still provided some nice opportunities (long lens highly recommended). 2 out of 3 AMOY (American Oystercatcher) nests have cute chicks still hanging around their nest sites in Area A where 1 AMOY nest seems to still be in incubation process. The best find of today, what made my day for sure and I still have a big smile on my face at 9PM, was a great find of 3, one day old, Piping Plover chicks! WOW! They are so cute and fast :D I tried to record video of them but they run so fast :) I was happy "to put" a long time "internet" friend on the location of these birds, which I believe was the very first time for her to see and photograph these cute running "cotton balls". One other person joined me as well, and she had a blast too :) Thank you for being so respectful and approaching slowly! Way to go! As of the morning of 6/29, the Rain Pool is completely dry. All chicks mentioned in the previous update are still being seen - Thank you N.P. for the update! Today, 6/30, Piping Plover chicks were not seen in the late afternoon but this might be caused by the strong winds in the late afternoon - Thank you I.B. for this update! Thank you all for sending the latest reports! You are all helping each other! Just a quick update for those interested, I.B. reports that she found Piping Plover chicks in the same general area where they were seen in the last couple of days. This morning, I found another, just hatched Piping Plover chick. This makes for a fourth PIPL family that is successfully raising young at the NB. I know that there is more nests but those aren't close for photographs and are usually deep in the dunes. I also found two other AMOY families with young chicks, and it looks like that the 3rd nest in the Area A has chicks as well. Finally! 😬 Worth mentioning, are also Least Tern chicks that started to hatch recently. This morning, I found 2, couple of days old, chicks and couple of older ones hiding in the tall grass in the Area B. All people that made donations via PayPal, and requested location updates, received the newest map right away. If you donated but didn't get my map, please send me an email. I think, that this season is the best for AMOY (American Oystercatcher) chicks. I haven't seen so many just hatched chicks in late June/early July in my previous seasons! Common Terns are right on time with their chicks. I hope that Black Skimmers will be as well. I will keep you posted! Thank you once again to all sending the latest news! I really appreciate your help! Today's weather was perfect to be on the beach but unfortunately, I got stock at work again 🙈Bummer. Morning visit at the low tide. Despite rainy weather in the last couple of days, I was surprised to find the Rain Pool completely dry! I wasn't expecting this at all. Today's highlights were at least 5 different American Oystercatcher families feeding juvenile birds, south of the Area A, right at the edge of the ocean. There are still younger birds at the East Colony, but the older ones are spending time at the shoreline. Fun to watch and photograph them for sure, especially the oldest ones already flying but still depending on their parents' care. Piping Plover chicks can be found still in the same area as I reported before, but now they are in juvenile plumage and not as cute as before 🙈 All chicks at the beach are growing up so fast! As I was one of the first ones near the shoreline this morning, I saw a flock of 20+ Black Scoters swimming near the beach. Mostly hens. Another new sighting for me this summer, was a small flock of Sanderlings, some still in a breeding plumage. Make no mistake, fall shorebird migration has already began. Fun times ahead! New to me was a surveillance camera situated at the West Colony. I wonder what they are monitoring this late in the season. Trespassers perhaps? Thank you for the latest donations! I really appreciate your help! Just a quick update for those waiting for skimmer chicks :) I've got multiple reports, with today's evening being the latest, that none of the Black Skimmer chicks hatched yet. Thank you all for sending reports! Also, do not forget to use my Amazon affiliate link. This way you are helping me out without spending extra money :) Thanks! The wait is over folks! I just saw my first Black Skimmer hatchlings this morning 😀 I found them in the west corner of the Area A. Unfortunately, for us photographers, they are situated far in the fenced off area, where the Black Skimmers choose to nest this year. Once chicks are a little bit older, they will come closer for sure. I didn't scan the whole east colony and I would't be surprised if there are closer, single nests there as well. At least we know that they started to hatch. Yay! Also, migrating shorebirds (adult birds I assume) are coming in large numbers. This morning, I saw 300+ Sanderlings, with few Ruddy Turnstones and Semipalmated Plovers mixed in. All were feeding along the shore and once the high tide came in, birds moved to the beach where they were resting. Thank you to all sending the reports! Things are definitely slowing down at the beach these days, as most of the young terns left the colony and more are spread out. The main attraction of late summers at the Nickerson Beach, Black Skimmer chicks, are still staying far behind the fence. Bummer... Hopefully this will change soon. Just a quick update. I've got multiple reports that older Black Skimmer chicks are getting closer to the string fence and more of just hatched chicks can be seen at the colony. Number of terns and American Oystercatchers is getting lower and lower as they start to leave the beach and are migrating south. I've also noticed that researchers moved the surveillance(?) camera from the West to the East Colony. For latest update, please read the comment below by Lesley Mattuchio. Thank you Lesley for the update! Yesterday, 8/24, Town of Hempstead together with NYS DEC and NYC Audubon staff banded, wait for it, 164 Black Skimmer chicks!!! The numbers are finally in, and thanks to all of you shopping via my Amazon affiliate link on the website, I was able to generate $47.76 for The Raptor Trust! Thank you all for supporting my blog! It means a lot to me and I'm happy that we all can help the wild birds! Have a wonderful 2018 and I hope you will be back for another great season to the Nickerson Beach! I just received an email from a friend that Piping Plovers and American Oystercatchers just started to arrive to the Nickerson Beach. For locals, it might be interesting to head over to the beach tomorrow morning to photograph them in the snow (hopefully, today's storm will produce the promised +10 inches snow ;) ) If this doesn't work out, you can always head to the "other" beach near by for a lingering Snowy Owls. If you need more directions, just send me an email. All who made the donation via PayPal in the previous season, will be granted access to the password protected site, where I will be providing frequent updates on the latest happenings at the Nickerson Beach. If you do not receive a password from me within 48 hours, please email me. Others wishing to access that page, can do so for a small fee, here: Nickerson Beach Updates with large portion of proceeds being donated to the The Raptor Trust at the end of the year. Putting all this negativity behind me I want to wish everyone another great season at the Nickerson Beach! I wasn’t aware of the construction but a little bit of a “google” search reveals that this is all being done to protect the town from future storms. All beaches along the Long Beach are receiving similar updates this year. 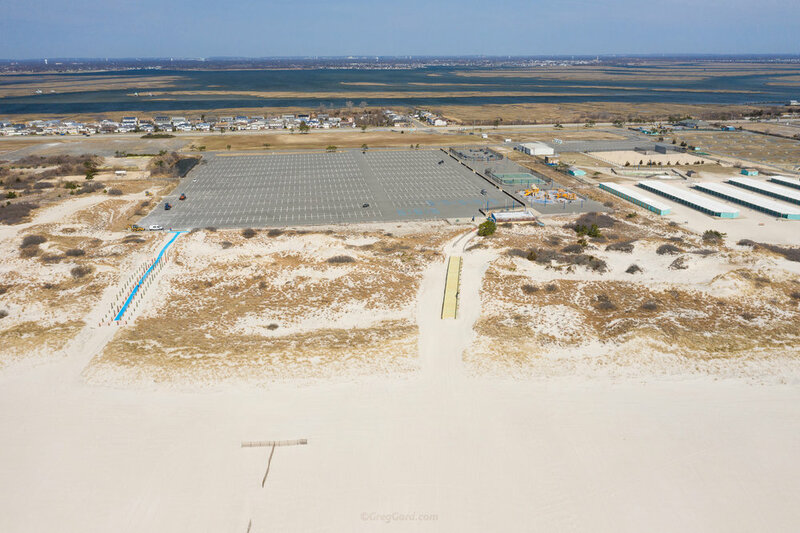 To my understanding, the plan is to elevate the dunes to +14 feet and replenish beaches with new sand to move the “mean high water” line to “widen” the beach. Area B has changed as well, especially at the far side (closer to the dune - not accessible), which shows some leveling done to it. Perimeter of the ropes seems to be enlarged compared to the previous season. Let’s hope that construction will be finished before the season starts and that all these changes will be welcomed by the biggest colonies of the nesting birds: Common Terns and Black Skimmers, that should be arriving in few months. Once the work is completed, I will update this post again with the latest photographs. Did you find this guide helpful? What should I change? What did you see interesting at the Nickerson Beach today?